I just love pinterest! Among all those boards on antique furniture – sometimes there are real treasures. 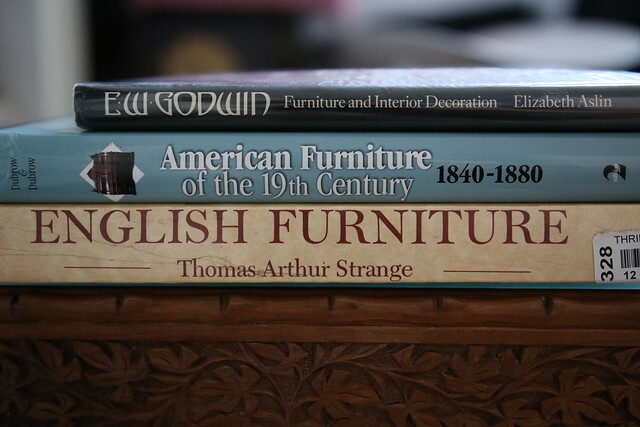 This time I found some good recommendations on books about furniture history. Books are shipped, but before this wonderful discovery I bought some really good books too. My first attempt to order books from Amazon UK, because delivery rates on Amazon US are quite high for Russia. The only problem is they deliver packages by airmail without tracking number. So I was a bit nervous about this order. This book has been in my wish-list for quite a long time. I didn’t see any good reviews of it, you know, I’m too curious, always wanted to know what was inside. “Making Miniature Furniture” is out of print, I saw it on Amazon available from different buyers (mostly US), but later found it on biblio.com. The book was available from UK, so I decided to give it a try. This particular copy is 1997 edition, originally printed in 1988. It’s had a bit different approach than of Harry W. Smith, though I quite liked it. No metalworking chapters, only wood. Lots and lots about instruments, principles of work. There are no furniture projects like Victorian table or something like that, but mainly general – building frames and doors, drawers. I liked these small references on different styles, nothing new, but still interesting.